Brian K. Vaughan is the writer behind several award-winning series, including Y: The Last Man, Ex Machina, Saga, and more. 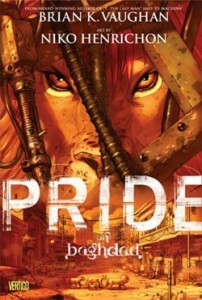 In 2006, he teamed with Nico Henrichon to create Pride of Baghdad, a graphic novel that follows a pride of lions that escapes from a Baghdad zoo after an American bombing as they struggle to survive on the bombed-out streets of the city. The tale is based loosely on true events. Despite making both ALA’s Great Graphic Novels for Teens Top Ten in 2007 and Booklist Editors’ Choice: Adult Books for Young Adults as well as featuring non-human main characters, Pride of Baghdad is frequently challenged for alleged sexually explicit content. I sort of wanted, you know, to tell a story from the perspective of non combatants. And I think it’s really hard for Americans — for any of us to sympathize with that other — you know, whether it’s another race or creed or nationality. But because animals transcend that, you know, I was hoping they would sort of bridge the emotional gap. And, you know, we can sort of sadly feel for animals in ways that we can’t feel for that other. Download a PDF of the Pride of Baghdad discussion guide here.